Fertilizer. Everyone knows what it is, but not everyone realizes how much of an impact it can have on a lawn care business’s bottom line. Some business owners are tempted to stick with the same fertilizer they’ve always used simply out of habit. Others may only look at the price per bag and try to save money by going with the cheapest alternative. To understand what goes into a bag of fertilizer, it’s necessary to go back through the supply chain. Input suppliers mine minerals from the ground to make phosphorous or potassium fertilizers. Other companies manufacture nitrogen (N) fertilizers, such as ammonia- or urea-based products. Then, there are companies like Koch, which takes those products and modifies them into “enhanced efficiency fertilizers” (EEFs) by adding stabilizers or coatings to create stabilized and slow- and controlled-release fertilizer technologies. From there, these inputs go to blenders or formulators who blend them together to make the final bagged fertilizer product. Distributors purchase those bags of fertilizer and then sell and deliver them to end users – residential and commercial lawn care companies, sports turf managers, golf courses and other sites. To answer those questions, Koch’s Drohen describes a hypothetical scenario comparing three different bags of fertilizer with three different analyses. The four major components in these bags of fertilizer are urea, Koch XCU® slow-release fertilizer, potash and something called “filler,” typically limestone, which offers little to no nutritional value to turf. Each fertilizer will be applied at the same typical lawn-care-application rate of one pound of N per 1,000 square feet of turf. As the amount of nutrients in a bag of fertilizer increases – and the amount of filler decreases – the price of that bag also goes up. However, since those fertilizers contain a higher percentage of N, it’s possible to use fewer bags of material to apply the same one pound of N.
“If we increase the nitrogen and potassium to a 24-0-12 formulation – 24 percent nitrogen – the per bag price increases to $16.50,” Drohan explains. “However, you’ll use just 725 bags to cover that same 200 acres, which would cost right under $12,000. 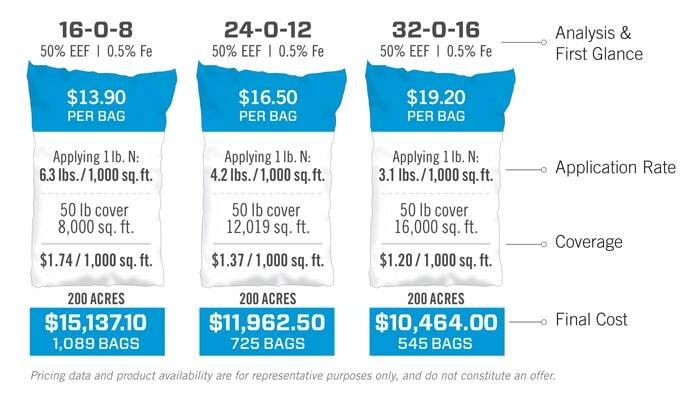 You’re saving $3,000 by applying fertilizer with more nitrogen content per bag. If we increase the nitrogen and potassium by another 50 percent to a 32-0-16 formulation which contains no filler at all, it’s going to cost $19.20 per bag. But – you’ll only need 545 bags to cover those 200 acres for a total cost of just over $10,000. It’s clear that higher quality fertilizers with less filler may be more expensive per bag, but can be far more economical in the long run. But, there’s yet another way that Koch’s enhanced efficiency fertilizer technology can positively impact lawn care businesses. As the percent of XCU in the blend increases, the turf’s N uptake rate increases as well. And, better N uptake means healthier, more attractive turf that generates positive word of mouth from customers. “EEFs really allow you to optimize the value of the blend,” Miltner adds. “Greater nitrogen uptake efficiency and better longevity means lawn care companies can save on fertilizer, decrease freight costs and reallocate labor for other uses. *All prices mentioned within this article are for demonstration purposes only. Actual prices may vary.